Colin Donnelly was born in 1959 and has excelled in two branches of long-distance athletics: cross-country and, especially, hill running. An internet debate about who is Britain’s best-ever fell-runner comments: “Colin Donnelly had (and still has) the speed and endurance to set even more records. He has more or less soloed every long-distance challenge there is, without support or route advice. If he was better organised, he could have achieved more than anyone else. Perhaps that is the way the great man likes things to be: out there on his own, doing things his own way”. While I agree that Colin has always been a very unusual individual, he has also been an exemplary team-man for his only cross-country club – Cambuslang Harriers. According to the club history, Colin Donnelly joined around 1976 as “a novice runner with lots of raw talent”. He ran for them in the Scottish CC Relay in 1977 and in 1978. I well remember the latter occasion, at Beach Park, Irvine. Despite the distance being too short for me, somehow I had squeezed into the talent-loaded ESH team and Allister Hutton had handed me a seventeen second lead. Young Colin scorched after older Colin and very nearly caught up before his impetuousness and my stamina took effect. As I edged clear again, before handing over to the flying Ian Elliot who ensured victory, the bellowed insults of a Cambuslang ‘supporter’ rained down on the poor tired youngster. He still gained three seconds and handed over second, although his team was eventually edged out of third. Not surprisingly after such an unfair ear-bashing, Donnelly avoided this event thereafter; but his record in the National CC was to be truly amazing. Around the same time, Colin Donnelly studied at Aberdeen University and once or twice I kept him company on a training run. Apparently he ran sixty miles per week, as hard as he could. When I suggested that a few slower recovery sessions might be a good idea, he ignored the suggestion completely. He also turned up on a trip to the Isle of Man Easter Running Festival. No doubt he ran well, but what I remember is his total innocence about the probable effects of beer-drinking on an inexperienced young fellow! However before very long he became a mature, disciplined, teak-hard competitor. Colin’s first appearance in the Scottish Junior CC National was in 1979, when he finished a respectable 20th. His debut in the Senior National took place in 1981, when he was third counter for Cambuslang in 29thplace. No sign of what was to come! For several years, Colin was in the RAF and based in Wales, where he made a considerable mark on the hill-running world, as will be described later. Consequently it was 1987 before he featured once more in the Senior National for Cambuslang Harriers – a team which was to dominate the event utterly for the next twenty years. Perhaps the quickest way of communicating details of Cambuslang’s fantastic run of success is a simple list. 1987: Colin 12th, team bronze. 1988: 6th, team gold. 1989: 12th, team gold. 1990: 15th, team gold. 1991: 5th, team gold. 1993: 8th, team gold. 1994: 9th, team gold. 1995: 8th, team gold. 1996: 22nd, team silver. 1997: 24th, team gold. 1998: 11th, team gold. 1999: 7th, team gold. 2000: 11th, team gold. 2001: 17th, team silver. 2002: 11th, team silver. 2003: 16th, team gold. 2004: 21st, team gold. And finally, at the age of 48 in 2008: 20th, team gold. Colin Donnelly amassed a total of no less than 14 team gold medals (plus three silver and one bronze) during a period in which Cambuslang Harriers won 16 titles. Has anyone ever shown such consistent team spirit and excellence? Not surprisingly, Colin continues to run very well indeed as a veteran. In Scottish age-group cross-country championships he won M40 titles in 2000 and 2001; M45 in 2007 and 2008; M50 in 2010; and (of course) a number of team gold medals. Perhaps his finest race as a ‘Master’ was a superb win (M40) for Scotland in the 1999 Five Nations Home Countries CC International at Grenville College, Bideford, Devon. However Colin Donnelly’s main claim to fame isn’t cross-country at all! He burst onto the hill-running scene with victory in the Ben Nevis Race in 1979 – the youngest man to win this famous event. He won it again in 1986; and lost to Gary Devine by only five seconds in 1988. In the interim Colin Donnelly had dominated fell-running, especially near his home in Wales, where he set many records, some of which have never been beaten, for example the Welsh 3000s (26 miles from the top of Snowdon to Foel Fras, including some 13,000 feet of ascent and fourteen summits). In 1988, when he was a local Eryri Harrier, Colin’s time was an astounding four hours 19 minutes. Colin Donnelly’s hill race victories are countless, but include the Snowdon Race, Cader Idris (6 wins), Buckden Pike, Shelf Moor, Carnethy, Kentmere Horseshoe and the Manx Mountain Marathon (31.5 miles, 8000m ascent). 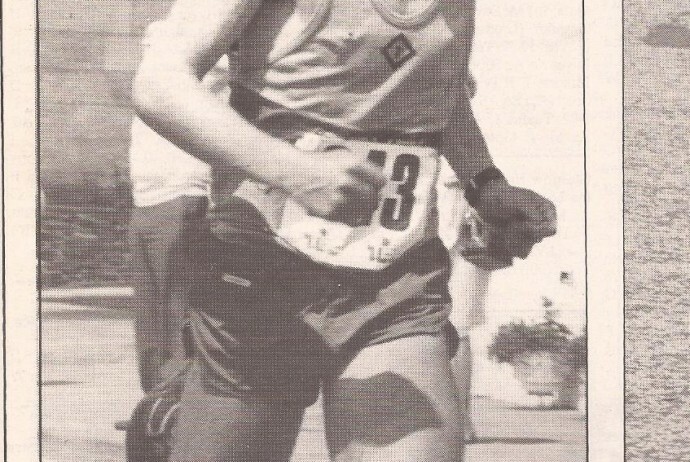 Colin Donnelly was British Fell-Running Champion three times in the late 1980s. In the WMRA World Mountain Running Trophy, he represented Scotland in eighteen successive races between 1985 and 2002 (plus another one in 2004): an almost unbelievable record. Colin’s greatest run, which displayed exceptional descending skills, secured a silver medal in the 1989 men’s individual short race at Chatillon-en-Diois, France. In addition, he was in the Scottish team (Tommy Murray, Bobby Quinn, Colin Donnelly and Graeme Bartlett) that won silver medals in 1995 (Arthur’s Seat, Edinburgh). On the 22nd of September 2001, in Ustron, Poland, Colin Donnelly won the M40 Masters World Mountain Running Championship by an enormous margin of 91 seconds. In 2002 (Innsbruck, Austria) he was third; and in 2005 (Keswick, England) second M45 to Dave Neill of England.